Oh, and let us preface this by saying that it’s #BlackOwned. 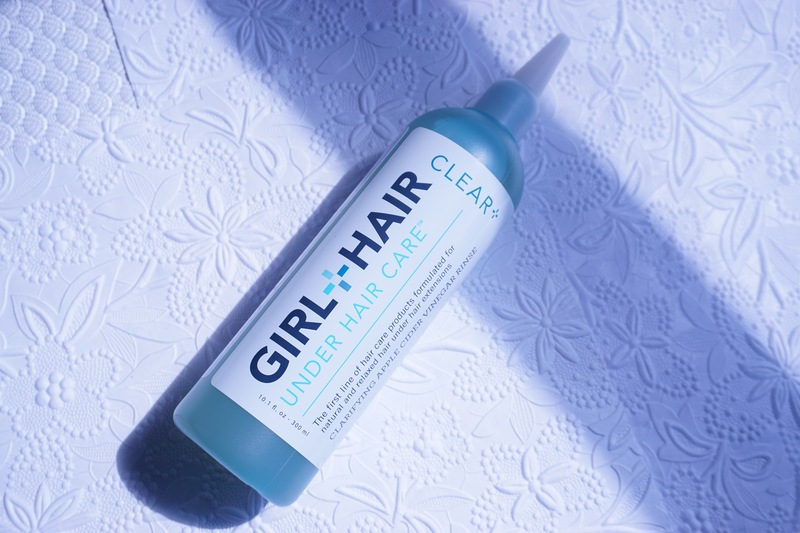 Now, remember that time we talked about Girl + Hair and their amazing new Under Hair Care line formulated specifically for women who love to rock a weave? No, well go read about them now and then come back to this article. But, for those of you who do remember, get very, very excited. They’ve just launched a new Under Hair Care Apple Cider Vinegar Rinse. The rinse is an organic rice water and apple cider vinegar clarifier created to gently remove buildup from your scalp and hair without removing moisture from your hair. Think cleansing your scalp under your protective style made easy. Apply the cleanser to your scalp, made easy by the nozzle applicator. Use your fingers to massage the cleanser in well. Rinse thoroughly. Repeat if necessary. Follow up with their conditioner, or another favorite. After trying the ACV cleanser, my scalp felt refreshed and very clean. One wash was good enough for me, but depending on your style and scalp condition, you may want to get in a second. I would warn that you must follow up with a moisturizer, oil or your own hydrating concoction for your scalp and hair. While I didn’ t feel like my hair was stripped of moisture (I’ll have to actually take my weave out to determine that), the squeaky-clean feeling compelled me to add a little more moisture than I normally do. I used a castor oil, but you can use Girl + Hair’s Restoring Balm if you want the full formulated effect. The Black couple owned cleanser can be purchased on their website for $17. Their shampoo, conditioner and hair restoration balm can be found on their site and at Vivrant Beauty.